Fabulous, lavish, fully-equipped Thai villa set in the hills overlooking the Gulf of Thailand. Two large balconies with jungle and coconut plantation views. Salt-water pool with mountain back drop. 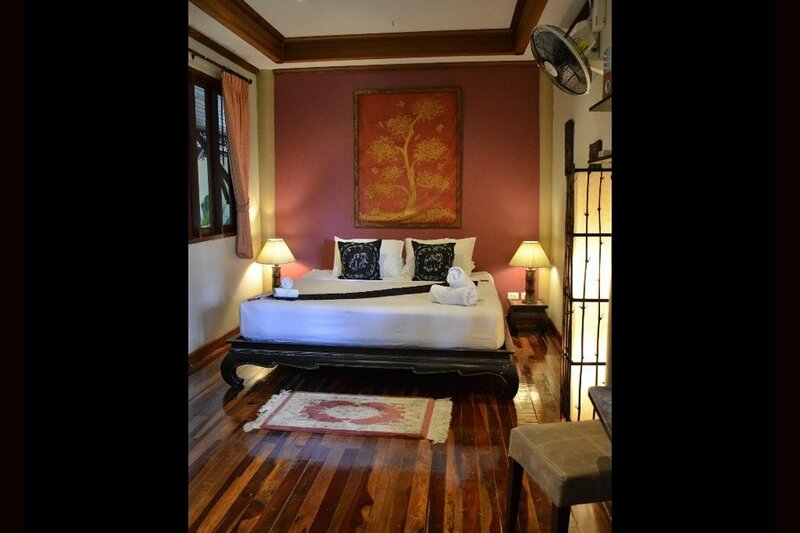 BAAN SIJAN VILLA is set within the tranquil area of the Angthong hills close to Nathon the capital of Koh Samui. This small town offers all the charm of a traditional Thai way of life. Our luxury villa is surrounded by the beauty of the Gulf of Thailand which lets the cool ocean breeze and the beauty of the mountains ease away your everyday pressures of life. The beach is a short distance away where you can still see the locals fishing with bamboo rods and the buffaloes being prepared for the islands famous bull fights. Baan Sijan Villa is built on four levels and offers our guests an enormous choice of options, whether it is pure relaxation, sunbathing on our many terraces, or just lounging, admiring the surrounding beauty of the sea and mountains, or you may of course prefer working out in our fully equipped gymnasium,or taking a sauna. After all that we can arrange for you and members of your party to finish your day with an in house famous Thai massage, the choice is yours. The evening brings a new surprise, as from the third and fourth floor balconys some of the acclaimed best sunsets in the world, are visible, looking over the marine park in the Gulf of Thailand. Finally out to wine and dine in one of the many amazing local beach restaurants. On entering the villa through the electrically operated gates you will observe the well tended gardens which surround the villa on all sides. The villa grand in size and furnished in contemporary Thai style to a very high standard, which comprises of the following . Ground Floor, fully equipped gym/sauna/massage room/table tennis, with lounge area tv/dvd/cd and bathroom. Second floor accessed by stairs which lead you into an impressive and grand open planned Lounge Bar which has a high vaulted ceiling and is surrounded on all sides with extensive amazing views of surrounding mountains and distant sea views . In this area there is seating of various styles, pool table and a balcony with outside dining and sun loungers which stretches around the front and side of the property. Also on this level is an outside kitchen area with BBQ, cooker hob and double sink for those special day’s or evenings. A number of steps then lead you to the Third Floor which comprises of the beautiful (salt water) swimming pool, with an amazing back dro p of the mountains behind. The lounge/dining room area leads off from the pool which has all the comforts of home. It has a 42” plasma tv/dvd/cd a large dining room area which has a table which can seat eight comfortably situated at the far end of this large impressive room. There is a double door entrance into an extremely large kitchen with extensive work surfaces, and a centre work station, the kitchen has all the modern facilities that one would expect to find. Also on this floor is a large bathroom and poolside dining facilities. Stairs leading to the Fourth floor which contains the following, office which has all modern communication facilities internet, fax machine, computer if you need to answer any important business issues while you are away. The five double bedrooms on this floor all have wet rooms en–suite facilities, and are furnished to a very high standard all with super king size beds, safes, fridges, iPod connections, and airconditioning and wall fans.Bedroom five is a very large suite or family bedroom, which also has a extra single bed in the room ,along with a lounge area with 42" tv/dvd. Also on this fourth floor is a beautiful reading lounge which looks out again onto the surrounding jungle and coconut plantations were you can watch the locals with trained monkeys collecting coconuts to sell locally. Also on this level is a private bathing area which is set overlooking the garden and with amazing views out towards the gulf and the wonderful islands of the world famous Angthong Marine Park. We are also able to arrange for hire by our guests are the following, car hire, mountain bikes, motor bikes/moped, 3 man kayak. We also can arrange for Spa treatments in house, and a laundry service and in-house cook if required. Rooms are cleaned daily and this is included in the price.Bed linen and towels changed every third day. All areas of the house have mountain and jungle views, on trhe upper levels sea and island veiws can also be seen. The villa has large open areas and this allows for refreshing breezes to flow through the property, which cools you on those hot days and nights. Due to the location and height of the villa you feel part of the natural enviroment and surroundings.